Simulation data provenance: Dr. Jin Lee and Prof. Tamer Zaki of JHU (see README-transition_bl for more details). 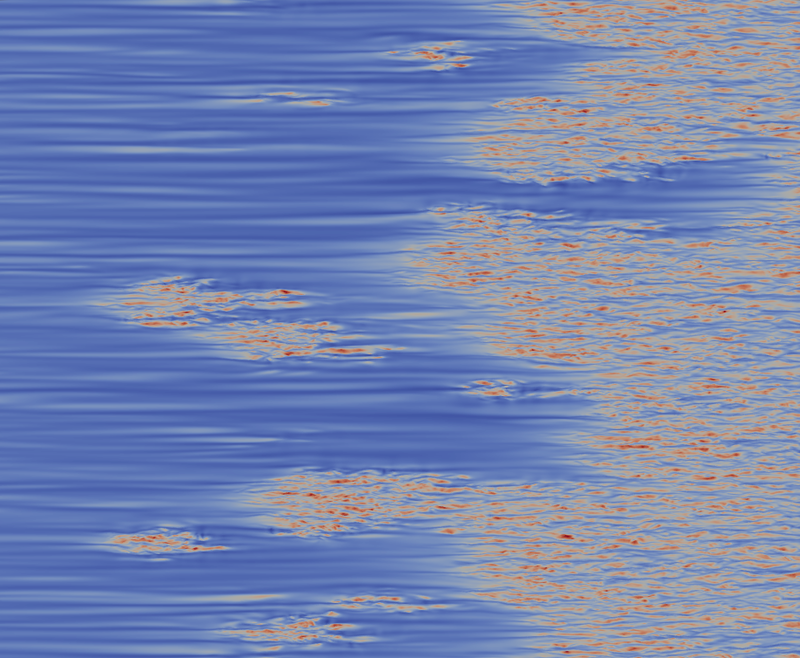 Direct numerical simulation (DNS) of a transitional boundary layer over a plate with an elliptical leading edge. Navier-Stokes was discretized on a curvilinear grid and solved using a finite volume DNS code. A fractional-step algorithm was adopted, and the spatial discretization was a staggered volume-flux formulation. The viscous terms were integrated in time implicitly using the Crank-Nicolson and the advections terms were treated explicitly using the Adams-Bashforth. Pressure was treated using implicit Euler in the δp-form. The pressure equation was Fourier transformed in the span, and the resulting Helmholtz equation was solved for every spanwise wavenumber using two-dimensional multi-grid. After the simulation has reached a statistical stationary state, 4701 frames of data, which includes the 3 components of the velocity vector and the pressure, are generated and written in files that can be accessed directly by the database (FileDB system). Since the grid is staggered, data at the wall are not stored in the database. However, JHTDB provides values in the region between the wall and the first grid point, y∈[0, 0.0036], using 4th-order Lagrange polynomial inter- and extrapolation. The y-locations of the grid points in the vertical direction can be downloaded from this text file.